Save the date for the Webcast below - make sure to attend, if you don't want to miss SOA & BPM news. 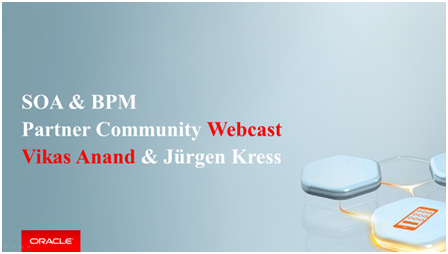 Join us for our monthly SOA & BPM Partner Community Webcast. We will give you an update on our SOA Suite 12c, Integration Cloud Service offerings and our community activities. You can join the Conference by clicking on the link: Join Webcast (audio will play over your computer speakers or headset). Visit our SOA Partner Community Technology Webcast series here.